Kickstarter: Calliope – Stop Motion Film Awesomeness! Just in time for Halloween comes a Kickstarter campaign for a spooky stop-motion film, Calliope, that brings together all-star creators from the world of designer toys (Circus Posterus’ toy designers Kathie Olivas and Brandt Peters), stop-motion innovator and Annie Awards Special Achievement recipient Martin Meunier (Coraline) and filmmaker Jon Schnepp (The Death of “Superman Lives”: What Happened). Based on Olivas’ classic toy character Calliope Jackalope, Calliope is a post-apocalyptic, fantasy adventure about an other-worldly girl who’s unaware that she’s actually Pestilence, one of the four horseman of the apocalypse. If funded through the now live [INSERT HYPERLINK] Kickstarter campaign, Calliope will be written and co-directed by Meunier, Olivas and Peters, executive produced by Schnepp and feature artisans, animators, and fabricators that have worked on stop-motion features including The Nightmare Before Christmas. Calliope is planned as an 8-10 minute stop-motion short film and is the most ambitious project yet from the husband and wife creative team of Kathie Olivas and Brandt Peters; it will be the first production from Circus Posterus Films, the couple’s New Mexico-based arts collective Circus Posterus. For updates follow Circus Posterus on Twitter, Instagram,, Facebook or visit www.circusposterus.com. Founded in 2007 by Kathie Olivas and Brandt Peters, Circus Posterus, is a one-stop online resource and distribution point for its stable of artists. Circus Posterus supports the creation of original artwork, then packages, markets, and licenses work on behalf of artists. By allowing artists to do what they do best — creating art and interacting with their fan base — Circus Posterus has created a business model which allows collectors and fans from all over the world direct access to sought after, US-made original artworks, and limited editions sculpture, prints, art toys, and a unique range of collectibles. Circus Posterus Films, in turn, supports the creation of original films by filmmakers who maintain creative control over their production process and finished films. Martin Meunier is a stop motion specialist who has worked with director Henry Selick for the past 20 years on such films as James and the Giant peach, The life aquatic , Coraline and Paranorman. He’s pioneered the use of Rapid Prototyping in this industry for replacement animation as well a variety of new techniques commonly used today. He has also worked for Oscar winning companies such as Tippet Studio, Digital Domain, ILM, Pixar and has collaborated closely with Jamie Hyneman from Mythbusters. His skills range from traditional sculpting and model making to computer graphics and compositing. Jon Schnepp is an American Director, Writer, Producer and Entertainer, working for Cartoon Network / Adult Swim, FX, MTV, Nickelodeon, SpikeTV, Magnet, Comedy Central and more. Schnepp started his career by editing “Space Ghost: Coast to Coast” back before Adult Swim was Adult Swim. He then directed the “Upright Citizens Brigade” pilot, made the backgrounds for Aqua Teen Hunger Force, and most famously designed and created the band characters of Dethklok and then directed 34 episodes and co-produced all four seasons of cult hit Adult Swim series “Metalocalypse”. Jon also directed the Dethklok concert tours, and co-plotted and did covers for the Dark Horse Comic Book Series “Metalocalypse-Dethklok”. Jon co-directed season 4.1 of “The Venture Bros”.”, directed the “Aqua Teen Hunger Force” 3D Origin for the movie, co-directed two episodes of Marvel’s “Black Panther”, wrote the Underworld: Endless War animated series, directed the animated Avenged Sevenfold web “Hail to the King”, and wrote and directed a segment called “W is for WTF” for the horror anthology “The ABCs of Death”. Jon has done voiceover as “The Wisdom Cube” in ATHF, as “Dr.Gibbetz” in Metalocalypse, and played himself in “Comic-Con: Episode Four: A Fan’s Hope”. Jon Schnepp has been co-hosting a very popular web series for the past two years called “AMC Movie Talk”, which won “Best News Series” for 2013 and 2014 at the International Academy of Web Television, and he now hosts his own comic book centric show called “Collider Heroes”. Schnepp has run several successful Crowd-Funded Campaigns like “Grimm Fairy Tales” and “Temple of Art”, and he recently completed writing, co-producing and directing a Crowd-Funded Feature Length Documentary “The Death of Superman Lives: What Happened?”, which has garnered amazing critical praise and is now available for purchase at www.TDOSLWH.com. Kathie Olivas is a multi-media narrative artist internationally celebrated for her contemporary toy and character designs, as well as her paintings. Olivas began drawing portraits as a child, and fell in love with creating a world that did not exist in her own reality with her imagination. While studying visual arts at the University of South Florida, Olivas worked as a portraitist and caricature artist, then at local galleries, curating exhibitions by both emerging and international artists. Olivas’ own work has since been exhibited at galleries and museums around the world. As a contemporary toy designer, she has created over 100 of her own “toys,” frequently partnered with clients like KidRobot ,Tomensosuke and Cardboard Spaceship, and has helped produce the work of several other contemporary character artists. 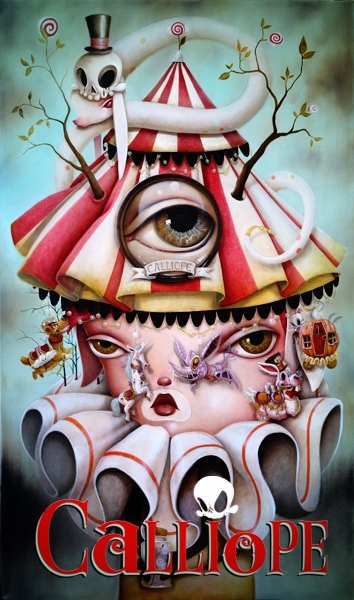 With husband Brandt Peters, Olivas owns and runs the internationally acclaimed artist workshop, Circus Posterus and its flagship store and gallery, Stranger Factory Gallery in Albuquerque, New Mexico. Southern California native Brandt Peters is an internationally recognized, award winning self-taught artist/designer, illustrator specializing in toy, character and animation design. His clients have included Warner Brothers, Spyglass Entertainment (MGM), DC Comics, Kidrobot Toys, and top international ad agencies such as JWT. Peters has created over 100 original toy designs, and exhibited his fine art extensively throughout the US and internationally. With wife Kathie Olivas, Peters owns and runs the internationally acclaimed artist workshop, Circus Posterus and its flagship store and gallery, Stranger Factory Gallery in Albuquerque, New Mexico.